Basalt is a dark, fine-grained, basic (low silica) igneous rock, often extruded as molten lava from volcanic fissures. Its low silica content means it can flow easily, often building up over the years to form large plateaus. As the basaltic lava cools, it contracts and solidifies. An extensive network of cracks often develop in basalt, which may extend many meters deep. These cracks tend to leave columns between them which are roughly hexagonal (6-sided) in shape. Among the more famous examples of basalt columns or pavements in the world are Giant’s Causeway (Northern Ireland), Fingal’s Cave (Scotland) and Devil’s Postpile (California, USA). 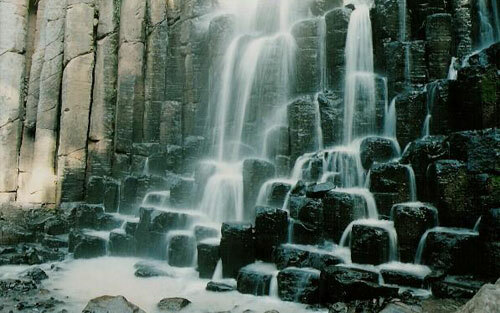 The best known location in Mexico to see basalt columns is about an hour’s drive north of Mexico City, at Santa María Regla, in the state of Hidalgo. 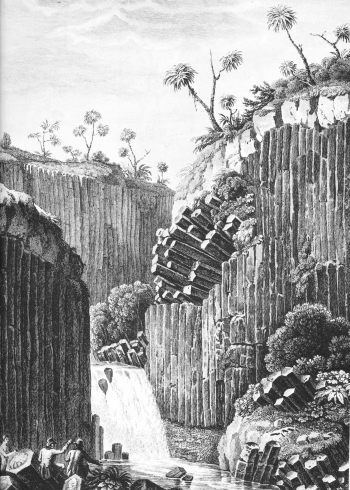 These columns, attractively located on the side of a canyon, with a waterfall tumbling over some of them (see sketch), were visited by the famous Prussian scientist/geographer Alexander von Humboldt, during his exploration of Mexico in 1803-04. Some individual columns are 40 meters tall. Basalt prisms at San Miguel Regla, from Humboldt and Bonpland, Vues des Cordilleres et monumens des peuples indigenes de l’Amerique. The basalt columns of Santa María Regla are one of the locations described in The first geography fieldtrip guide in Mexico. They are also one of Mexico’s top 13 natural wonders. Other locations in Mexico where basalt columns or prisms can be seen include a quarry between the towns of Jamay and Ocotlán (Jalisco), the south-facing slope of the hills overlooking the town of Chapala (Jalisco) and the Salto (waterfall) de San Antón (Cuernavaca, Morelos). Mexico’s geology and landforms are analyzed in chapters 2 and 3 of Geo-Mexico: the geography and dynamics of modern Mexico. Buy your copy of this book today!